If you are an avid Lord of the Rings fan, you can agree that one of the coolest characters is the infamous Legolas. There is something so unique and so fascinating about archers. The truth is, there is no greater feeling than holding a bow and arrow, aiming at a target, and watching the arrow release and head straight for the bullseye if you are lucky. It’s still equally as exciting when you completely miss the target – it’s about the experience that matters. Now when it comes to the youth, you can only imagine how they view archery. That is why, today, we are excited to share with you the very best of youth bows on the market today. So, if your child or loved one is overly-excited about archery or wants to become the next Legolas, these bows are bound to become their next obsession. All of these products have been thoroughly evaluated with a strict process – meaning, these products are incredibly valuable, cost-effective, and worth your consideration. Thankfully, now you won’t have to travel to Middle Earth for that archery experience – you can create in your own home! 1. 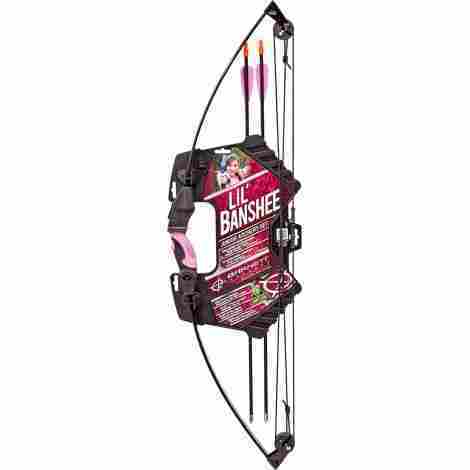 Barnett Outdoors Lil Banshee Jr. When it comes to archery, individuals consider this one of the most difficult sports to learn and get into. However, with a proper mindset, learning the art of archery, and a proper archery set, of course, an individual can become the Katniss Evergreen of his or her town. With that in mind, we are eager to share the first youth bow on this list. This is the Barnett Outdoors Lil Banshee Jr. Compound Youth Archery Set. Here are two points individuals should take into consideration. What is one of the most important parts of a youth bow? If you are new, don’t feel bad! It’s the grip. Without a proper grip, an individual will not be able to hit their target correctly, or they may hurt themselves in the process. Therefore, this manufacturer ensured the best grip possible with a reinforced soft touch grip design that is easy to hold and easy to use. Individuals that are left handed are not excluded. Part of the grip design that makes this one of the most highly touted and desired youth bows out there is the fact that this user has included an ambidextrous design. Therefore, individuals will have no problem to use their bow with both hands. Most importantly, this allows users to learn two different ways of handling the bow, which adds for better practice. With all of this in mind, it is time to talk about cost and value. It is important to keep in mind that this brand is highly touted and has 5 stars in their reviews. With that in mind, the price is actually very surprising. Considering that it is an archery set, individuals will appreciate the low cost. Now, as far as quality, it may not get better than this manufacturer thanks to the extensive design process that went into creating this archery set for youths. Quality design that is easy to use. The plastic material that is durable and easy to clean. This item is not for sale in specific zip codes due to regulations. This next youth bow may be one of the best in the industry. 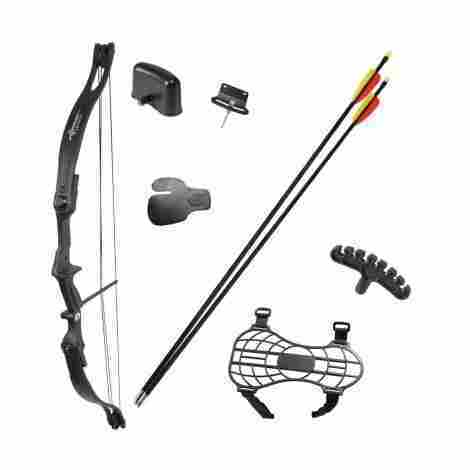 This archery set comes with everything an individual needs to be properly prepared for the archery range. With that said, we are eager to share product number 2 on this list. This is the Corsman Elkhorn Jr Compound Bow, a quality youth bow designed for a novice in the field of archery. Here are two important points to take into consideration. One of the most important aspects of an archery set is the materials used. Without the proper materials the bow may break, the string may snap, and the set may not work properly. With that, we can say that this manufacturer focused on the most quality materials in the industry. For example, this manufacturer created the bow with a durable heavyweight composite limb that resembles more professional bows. Other than that the composite center includes a shot riser with a larger sight window so individuals can ensure the best short possible. When it comes to archery, there are no cheat sheets in trying to become better every day. It takes practice, dedication, focus, and hard work. Therefore, this manufacturer makes it easier for individuals who are passionate about archery to focus and have a fun time in the process. This archery set is perfect for young archers that are new to compound bows. With that said, the grip is a right-hand placement only that ensures proper hand placement and a better shooting range. This is the perfect starter bow for kids who are passionate about archery. As we talk about cost and value for this particular archery set, we can say that it is worth the cost, considering it is specifically designed for kids new to compound bows. With that in mind, what is even better for the parent is that they do not have to worry about purchasing any more items for the set. The set comes with a complete kit that is ready to shoot for the low cost. Considered one of the best, we highly recommend it if you want an easy to use archery compound bow set. The compound bow is easy to use and very durable. Materials are strong and can stand the test of time. Great sight window view design. Easy grip and right-hand placement design. Users have mentioned that the accessories are not as well quality as the bow. Now that we are on product number three, it is time to switch it up a bit. If you are a parent reading this and the last two products made you a bit nervous and if your kid wants to get archer-happy, then this is the safer alternative. This next youth bow is perfect for kids that want to learn how to become an archer and perfect for parents that do not want to stress that their kid wants to learn how to archer. With a safety design element and durable design, the Zing Air Z-Curve Bow may be the best bow for kids that also combines safety and security for the parent. The fast load bow is designed for the novice archer that wants to learn how to better pinpoint their shot. With that said, parents will appreciate the safety design and plastic material that the bow is made from. Since it is made of plastic, it is much easier to handle and carry than other youth bows. Other than that, the lime green color makes it easy to spot and overall, a great quality bow for kids and teenagers. The arrows for this particular bow are designed with safety in mind. The arrows are made from a soft and safe foam material that has pinpoint accuracy but also will not hurt in the case another person is in the light of sight. More so, two of the arrows, the long-range RedX arrows can go up too 100 feet. However, the bow comes with a third arrow known as the Foamtek arrow that has a foam suction cup tip that can easily stick to anything. This allows the child to perfect their shot if they are aiming at a target. With that in mind, they are all high quality and easy to use. As we take cost and value into consideration, it is important to keep in mind that this bow set is designed from plastic material, especially for little kids. With that, the price is significantly lower than most bow sets. However, if handled with care the bow set can last a really long time. Users will appreciate the quality of the darts and the string. Lastly, this may be considered one of the best gifts for kids who want to learn archery. High-quality kids bow perfect for novice archers. Great gift idea during the holidays. Three arrows to learn how to shoot. Nice window line of sight. Users have mentioned that after a long time of use the stretchy string snapped. 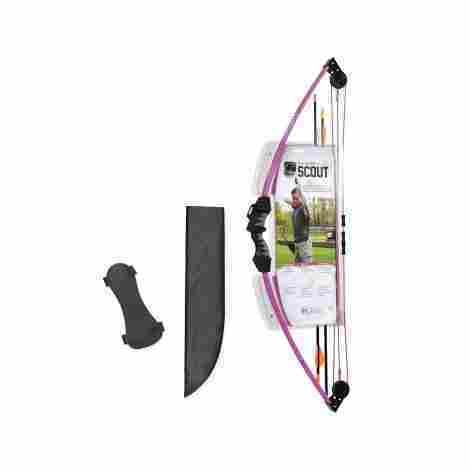 This next archery scout bow is considered a more advanced youth bow. Although it is designed for more advanced archers, this next bow is also perfect for the novice that wants to enhance their archery skills. The design of the bow set is durable, can withstand the test of time and it is perfect for individuals that are passionate about archery. Designed for long-term use and practice, individuals will tout and appreciate the Bear Archery Scout Bow Set and all of the great features and materials that went into designing this two-wheeled youth bow. This bow set is a really great and complete all-around bow set. It features all of the essential that an individual needs to have a great archery experience. The bow set includes a durable hand grip and 1 pin sight. Other than that, it includes finger rollers and an armguard for safety and better accuracy. Individuals will also appreciate the arrow quiver and 2 safety glass arrows that are designed with safety and accuracy in mind. 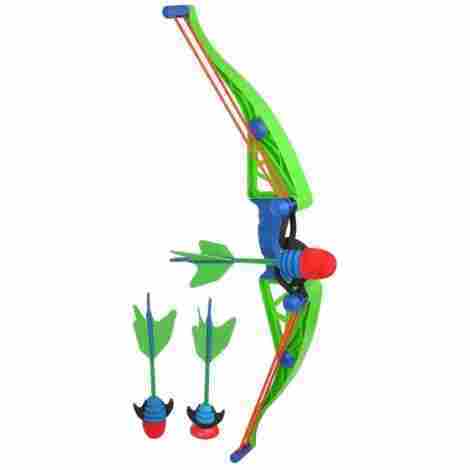 This manufacturer thought of every essential an aspiring archer needs when designing this archery set. This particular youth bow set is designed for young aspiring archers. With that, young archers can expect a draw weight of 8 to 13 lbs. and 16-24-inch draw length. With that, the design is ambidextrous so users between the ages of 4 to 7 years old can use with easily and wisely. However, older users will have the same amount of fun thanks to the quality design and appeal of the bow. Now that we have talked about a couple really great features about this particular bow set, what is the cost? Well, the cost is pretty standard with most bow sets and individuals can expect to pay the same as they would for a standard youth set. With plenty of bonuses, we think the cost matches the value. Other than that, a parent or person giving this as a gift can decide between four different color choices to choose from. Quality bow set designed for young archers. Durable materials went into creating this bow set. Users will appreciate the bonuses. Pin-point accuracy for easy use. Perfect for the novice archer. Users have mentioned that it is not for left-handed users despite the claim. Once again, we want to switch it up and bring individuals a safer alternative to the common youth bow set. Parents will appreciate and love this next bow set. This set is designed for quality use for kids that want to learn to play with a bow. Perfect for parent-kid bonding time, this next set is designed to withstand the test of time and gives aspiring little archers inspiration and practice. Let’s talk about the Toysery Kids Archery Bow and Arrow Toy Set, a quality set for kids. What makes this archery set one of the best for little kids is the high and incredibly durable plastic. Made from ABS plastic, this is the perfect material that is not harmful to little kids and can also stand the test of time. This bow set is perfect for multiple hours of archery fun without the fear of it braking. With that said, it is lightweight so little kids can hold it with ease. A great addition to this set is the arrows. Children will love to repeatedly shoot the arrows from the bow thanks to the material and design. They are designed with a sucker at the end so the areas easily stick to any surface. With this in mind, users will appreciate the high-quality arrows and the incredibly colorful target. As far as cost and value, we can say that this archery set may be one of the best for little kids. This is, in no way an archery set for a more professional archer. It is intended for little kids to have fun and enjoy. Therefore, the cost is relatively low considering that it is the perfect gift for little kids. With this in mind, the quality is great and it is durable enough to withstand multiple uses. High-quality plastic archery set for little kids. Comes with everything an individual need to use right outside the box. Parents have mentioned that it is somewhat cheap compared to other kids bows for the same price. It is time to introduce one of the best bang-for-your-buck deals right now. This next archery set is perfect for youth archers that want a quality bow set to practice their skills. With that said, what makes this even better is that it is a 2-pack wooden bow set that individuals can begin using with their friends today. Let’s talk about the Adventure Awaits 2-Pack Handmade Wooden Bow and Arrow Set. Here are two important points to keep in mind. It seems that items made of bamboo wood are becoming more prevalent and brands are jumping on the bamboo wood bandwagon. With that said, this set is made for pure bamboo wood and it is designed to withstand the test of time. Other than that, bamboo wood is long lasting and overall, looks really appealing. Little kids will love the smooth surface and quality of this bow set. With a more authentic feel, one of the best aspects of this set is that it comes with 20 wood arrows for less picking up time. The last thing a kid wants to do is shoot three arrows and then have to go pick them up. Therefore, this brand included 20 arrows, 10 per child. So a kid can invite his or her friend over for a fun game or practice. With that said, the parents will rest assured that nothing will break and nobody will poke their eye out thanks to the safe rubber tip that is bendable upon contact with a surface. As far as cost and value, we believe that nothing beats the authentic design of a wooden bow and arrow set. More so, this set is made from a quality bamboo material that is designed to withstand the test of time. With that in mind, the set is perfect for little kids and parents will feel assured at the safety of the bow and arrow set. Now, what is even better is that it comes as a double pack. Essentially, for the same price as one bow set, a child is receiving two. 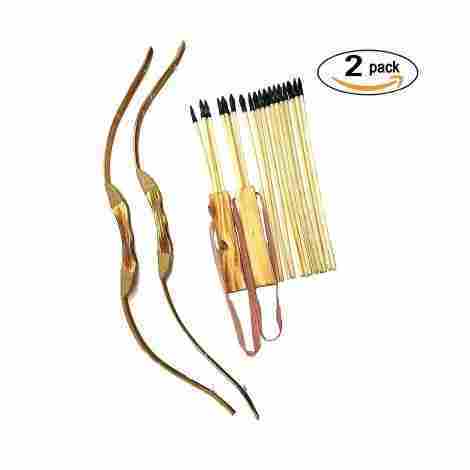 This is a deal we highly recommend for parents that want to give a great bow and arrow gift set. High quality set that users and individuals will appreciate. Great for birthday parties and other youth activities. Parents feel more secure thanks to the rubber tip. The bamboo wood is durable and great for long-term use. The rubber tips do not stick so users cannot point at a target. Speaking of perfect for parties and kid’s activities, this next set is designed to entertain the little ones! This next set includes a 20-complete bow and arrow set with 10 bows and 10 arrows. With peace of mind, this next set is durable but harmless so all of the inspiring archers can take a turn shooting a bow. Parents will appreciate the quality and also rest assured that no child is poking their eye out. Let’s talk about the Ginerscoolstuff Bow and Arrow Kids Archery Sets and two important points parents should take into consideration. This bow set, more than anything is simply a fun children’s bow set. If your child has shown an interest in archery, then why not throw them a fun archery party. With that, parents will rest assured that the set is safe since it is meant for children. With that, children will have no problem being able to use the archery set because the bow has an opening that allows for the child to easily place the bow. After a simple pull-back of the string, the bow can go far and children will enjoy endless hours of fun. This archery set is perfect for parents that want a fun party activity. With that in mind, the archery set has multiple colors to choose from so children never get their colors mixed up. The colors include pink, yellow, green, and orange. However, considering that there are ten, no child will ever go without an arrow. As we take cost and value into consideration, this next archery set is not a professional archery youth bow set. Therefore, the very low price reflects the plastic set and its intended purpose. 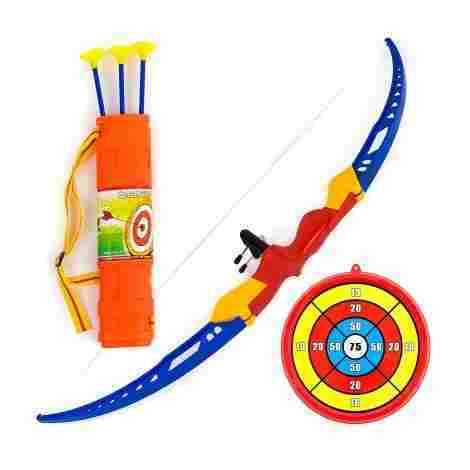 In fact, this archery set may only be perfect for little kids that want to have some short-term fun. With that said, it still is a great price considering that it comes with a set of 10 bows and arrows. With this in mind, we highly recommend it for your next birthday party. Great plastic set of bows and arrows. Little kids will love the multiple color options. Parents feel assured that it is safe to use. Not a professional archery set. Low-quality set that may snap easily. For the seasoned child archer that wants a more authentic experience and for the parent that still wants their child safety ensured, we are eager to share this next youth bow archery set. This next set includes everything that a child needs to feel like a professional archer. The quality, the design, and the colors are all enough to captivate and surprise the young novice archer in the family. Let’s talk about the Liberty Imports 32” Toy Archery Bow and Arrow Set. Here are two points parents should take into consideration if they are interested in this bow set. The last thing a parent wants to give as a gift is an incomplete bow set. With that, this manufacturer has developed one of the best child archery sets that comes with everything a child needs to start their professional archer experience right away. The set includes four arrows. Now, what is even better about the arrows is that parents will love and appreciate the quality and the fact that they also come with 4 suction cup ends instead of pointy ends. Now, this is a new feature on this list. What makes this manufacturer even better is that they included a sturdy and well-built quiver in the set. A quiver is what a child uses to carry around his or her bow and arrow set. It is designed for easy carrying and lightweight enough that a child can wrap it around his or her waist. With a waist strap, a child will feel confident and excited to wear the quiver and the parent will feel assured that safety is a top priority. As we talk about cost and value, we believe that this one is well priced and perfect for children that want to become archers. Now, what is even better is that parents will appreciate the quality of the bow and arrow and will tout the fact that this manufacturer has created a quality bow and arrow set. With this in mind, the price is standard considering that it comes with an easy to carry bow quiver. Lastly, parents and children will love the color design that makes it easy to spot in case a child loses an arrow. High-quality archery set for children. Plastic design is easy to hold and lightweight to carry. Comes with a bonus quiver that matches the quality. 4 suction cup ends that ensure safety. Great gift for the archer of the family. Cool color design for both girls and boys. Users have mentioned that the arrows have broken after about 6 months of use. 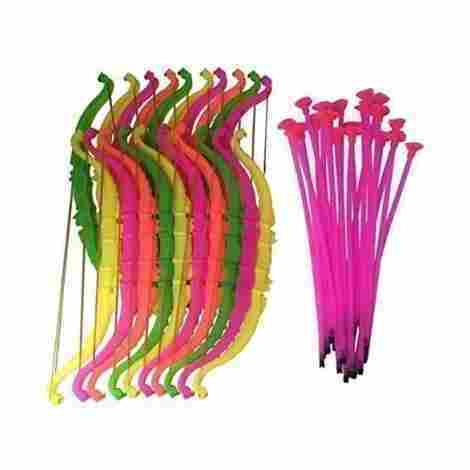 Following the child and kiddie sets we have been talking about, we are eager to share another really cool youth bow set that children will love to have at their next party. Parents will appreciate the quality and safety measures of this next set, making it the perfect gift for any occasion. 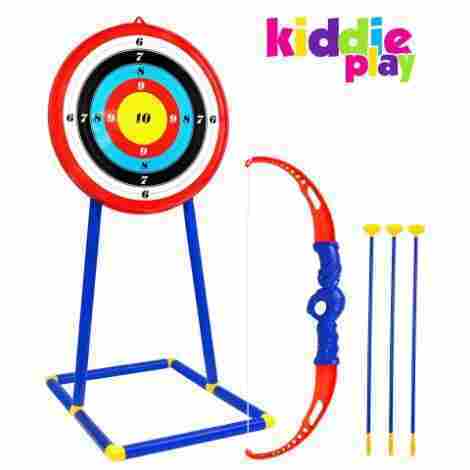 Let’s talk about the Kiddie Play Toy Archery Set. Here are two great points that parents should take into consideration if they want to get this set for their child. Now, this feature is what makes this set much different than any other set. This set comes with a free standing and stable stand. This means that a parent can easily place the stand and the target anywhere without having to tac it to the wall or a tree. More so, the option of removing the target from the stand is possible, however, the stable stand gives it more flexibility. Therefore, a parent can easily place the stand at a party anywhere it is best suited. This bow and archery set is perfect for any child. It is made from an ABS plastic design that is both durable but not strong enough to hurt anyone. With that, the arrow comes with a suction cup end so it can stick properly to the target, an aspect that parents will appreciate. Other than that, the string is durable but not enough to send the arrow flying hundreds of feet and knocking down a bird or an apple. With that said, it is the perfect power range for kids 5-9 years old. As we talk about cost and value for this particular set, you have to take into consideration what comes with the set. This set includes one bow, three arrows with a suction cup, a target, and a stand. With that said, it is priced according to other bows that are of better quality. We believe what brings the price up is the stand. However, for a party, it is the perfect bow set to have. Users will appreciate the quality bow and the materials. Comes with a free-standing stand. The stand can be detached from the target. Priced like more professional sets, which is considered pricey. As the last youth bow and toy set on this list, we are eager to share with you the Texas Toy Workshop Bow and Arrow Set. This next set comes with everything a child needs to begin their archer journey. With that in mind, what we can say is that this may be one of the most appealing toy sets considering that it is made from wood. Parents will love the high-quality materials and kids will love the quality of the set. Let’s talk about two important features. When creating something out of wood, the most important aspect is that it needs to be designed for long-term use and made of a durable wood material or composite. With that, this manufacturer ensures long-term use, as long as kids are careful with the wood. It can snap in half, but if it is done with force. 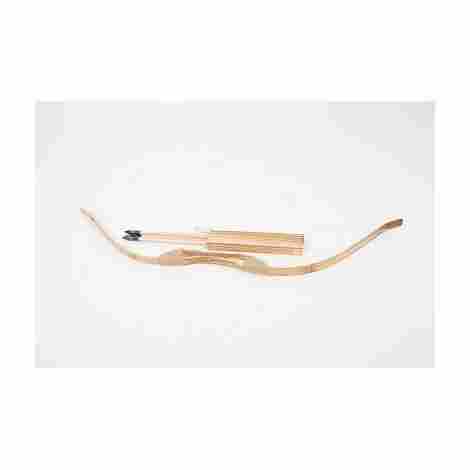 This wooden bow and arrow set is designed from quality and intended for children that want to be archers. This set comes with everything a child needs to begin shooting right away. With that, parents will appreciate that they will not have to buy any extra parts or further materials when it comes to this set. In all, the set comes with one bow, three arrows, and a quiver. The quiver is designed for lightweight carry and the arrows include a rubber tip that is easily bendable upon contact. With this, parents can rest assured that the child will not cause any harm during their practice. As we talk about cost and value, one would think since it is made of wood that the price would go up significantly. On the contrary, the price is very fair considering it comes with a total of five different parts. With that in mind, it is made of quality materials and parents will appreciate that this manufacturer took safety into consideration. Quality wooden bow and arrows for the price. Three arrows with safety rubber tip. High-quality youth bow for practice. Hole drilled in the middle of the handle for an easy aim. A trusted brand with excellent customer service. Users have mentioned that this is better as a prop than a practice set. Archery is arguably one of the oldest sports in human history. For the longest time, human beings have performed archery as an essence of sports but also for human survival. Prior to the development of guns, bows and arrows were a commonly used medium for attacking enemies from a distance, hunting, and even fishing. Now, evidently, none of these youth bows is designed to do any of this; however, they do serve as a great introduction for a parent to teach their child more about the art and sport of archery. In saying this, no matter the type of product that you decide to purchase – it’s always important that you take precaution and ensure your child’s safety. What youth bow captured your attention? Now that we had the time to share with you the best products on the market, we thought we would offer some more insight on how this buying guide was created. Let’s consider this the “super cool behind the scenes moment that everyone is interested in after watching their favorite TV show or movie; however, this is an online article.” Anywho, prior to jumping straight into this guide, we knew that it can be hard for consumers today to find the time to do the proper research before purchasing a product. I mean, have you ever picked out a product and, rather than doing any research because of the thought of the amount of time that needed to go into it, you simply added the product to your online cart and moved on? Everyone’s guilty of it! Now, raise your hand if that product that you bought turned out to be a flop. To alleviate this problem, we utilized a comprehensive system, more formally known as the Criteria Used for Evaluation. This system was put in place to help us find the absolute best products. At the core, this is our system for weeding through each product, analyzing the value, and evaluating whether or not it’s worth your consideration. Some characteristics and criteria that we looked at included the build quality of the product, the materials used in construction, and even the cost and value. Should you want to learn some more about the “behind the scenes” of this buying guide, keep on reading! The single most important criterion that we came up with was the build quality of a youth bow. In truth, our goal with the article was to highlight only the best products – and to be the best, the bow needs to be a representation of quality. Furthermore, when we started this article and looked at each product in contention, the first thing we did was scan the bow for how it was built. Typically, we can receive this information from the product description. In some cases, we needed to do extensive research to learn more about the construction process. From there, we always looked at the many pictures the manufacturer shared with us. This spoke volumes for us! We were able to draw some strong conclusions regarding the build quality. The last part of the process was looking at the customer reviews and see how people were responding to the overall product. The second most important aspect of any youth bow is the type of materials that the manufacturer used to construct the bow. Just like a fisherman – you wouldn’t want to purchase a faulty wooden fishing rod, especially if it can’t handle catching even the smallest fish. With that being said, before we picked any products for this article, we scanned the market for all the different materials that manufacturers were using for the bows. We wanted to know what competitors were using so when we were picking out products, we had a good idea of what the best materials were. 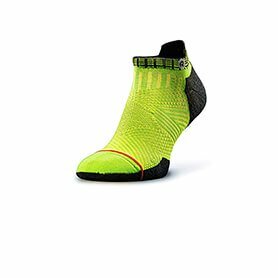 From there, we furthered our research by thoroughly evaluating what the maker was saying in the product description, and even what customers were saying in their reviews regarding their thoughts on the materials used. So, should you be looking for the best youth bows, they are all in this handy buying guide. Durability – what does that mean to you? If you are like us – durability is literally a deal breaker or a deal maker. The truth is, who wants to purchase a youth bow that, after a few pulls, the string snaps or the bow breaks in half? No one wants that! Now, to avoid this problem and disappointing the future owner of the bow – we wanted to ensure that the product was durable. Now, sometimes, with youth bows, it can be challenging to really assess the durability of a bow. We had to really look at how the manufacturer assured consumers. Typically, they described the quality of the materials used to build the product – and in other cases, they offered a warranty to help motivate consumers. For us, we never take their claims with certainty. We always cross-reference their claims with external research and with customer reviews. In this, we can say that each of these products featured today has been thoroughly researched to ensure the best durability on the market. Bows and arrows are not always the safest toys to purchase for a child or loved one – neither is archery. It can be dangerous if the product is not built properly or if the individual is not educated on how to properly use the bow and arrow. With that being said, we take safety very seriously. So, for any product to be considered for our list, we needed to see some safety measurements. This could be seen through making the materials more flimsy, dull, or foam-padded. As with many other criteria, we did look at the customer reviews to see if anyone complained about the safety of a product. If we ever found a common problem, the product was removed from contention. When you are purchasing a youth bow, you want to make sure that the product is functional – and not a one occasion product. Most of the youth, once they get their hands on one of these youth bows, they will want to take it everywhere and practice/use it. With that being said, we wanted to make sure that, no matter the product, it boasted functionality for children. To discover this, we researched each product and looked to see what the product was intended for. We wanted to make sure that children could use the product anywhere, anytime. In our opinion, there are many facets that are important for consideration when evaluating products – but there may not be anything more important than the cost and value. Now, if you carefully read our article, you might have noticed this term throughout. The reason is this – it’s that important! For us, this is how we can ensure that our readers are getting their money’s worth for a product. Let’s be honest too – you don’t want to waste your pennies, right? So, what we did was scan the entire market for their price points. We noted the most expensive products, the cheapest products, and we even highlighted what seemed to be the average price for Youth Bows. From there, we evaluated each product based upon the innate value. We wanted to know what value the product offered both parents and the child. In this, we were able to draw conclusions regarding the connection of the quality of value, and quantity of value, in comparison to the price tag. The last piece of criteria that we want to share with our readers today is all about difficulty. Now, if you are a beginner to archery, or have no idea how the sport works, let us be frank – it’s challenging for first-timers. This is why there are different grades and styles of bows and arrows for the youth. Depending on your child’s experience – you will need to purchase the applicable youth bow for their experience. In light of this information – we knew that our readers would not want to purchase a youth bow that was complex to use or assemble. With that being said, we thoroughly researched each product, studied the images and how to assemble the product, and even looked at what customers were saying regarding the difficulty. If you are looking for easy – your archery journey starts here! Q: Can a youth bow be used for regular hunting? A: No. Typically, Youth Bows cannot be used for any means of hunting. Now, this should be a sigh of relief for many parents. With that being said, it’s important to understand what the purpose of a youth bow actually is. These products are meant to introduce children and the youth into the sport of archery. Whether you are looking to give your child a fun toy or seriously start training your child to perform archery in the future – these products are meant for those circumstances. With that being said, even though many of them are made from cheaper, dull materials, it’s still incredibly important that those using this bow are properly instructed in the basics of a bow and arrow. Q: How far can a youth bow shoot? A: After watching Lord of the Rings a few times, chances are, your loved one is wanting to shoot an arrow across fields, mountains, and whatever else may be in the way. Now, a youth bow, while it can shoot a great distance, may not offer the same distance that you might see in a movie. With that being said, we would like to say that the distance that a bow can shoot an arrow will entirely depend on the quality and build of the bow, alongside the individual using the bow. As many gurus would share with you, the distance that an arrow travels is directly correlated to the skill of the archer. Additionally, if the bow is made from cheaper materials and not meant to shoot across far distances – evidently that is what you are going to get. We highly advise looking at these aspects before purchasing a youth bow if the distance is important to you. On today’s list, users will find youth bows that can shoot arrows up to distances of 60 feet or more. Q: How do you know if a bow is for a lefty or righty? A: This is a great question that parents should ask before purchasing any youth bow. The reason being, to the surprise of many, some bows are actually designed per hand-designation. Now, in efforts to make consumer’s lives easier during the decision-making process, you might note that many products today are actually for both left-hand and right-handers. If you want to know specifically for a product, read the product description. Manufacturers will share who the bow is intended for. Should you not find this information there, consult with previous customers in the reviews. Q: Do youth bows typically come with arrows? A: Yes. Most youth bows will come with a standard amount of 3-10 arrows for your loved ones to begin their archery journey. Now, if we can be honest, this is quite a small number of arrows. With this, many consumers who purchase a youth bow, especially those mentioned today on our list, often opt-into purchasing more arrows. Q: Are all parts of a youth bow replaceable? A: This is a complex question to answer. The reason being – it really depends on the product and brand. Typically, most youth bow manufacturers will sell replacement parts in conjunction with their bow. However, there are a few products, specifically on our list, that are only sold in sets and, replacement parts are not available. If this is a decision maker for you, we highly suggest avoiding purchasing any product in sets. Those that are solo bows often can come with replaceable parts. Be sure to do your research before making a purchase.